Some new members aren't following the advice on posting links - please read it! If you're looking for the LostCousins site please click the logo in the top left corner - these forums are for existing LostCousins members only. Both the main LostCousins site and this forum have been upgraded to that you can log-in securely. If you are not automatically taken to the secure site simply add https:// at the beginning of the URL. Only registered members can see all the forums - if you've received an invitation to join please register NOW! Discussion in 'DNA Questions and Answers' started by jorghes, Feb 28, 2019. Anyone else seen the new ThruLines? It looks like it could be useful in that it doesn’t seem to rely on whether not or someone has a private tree, just if they have that person in there. It seems the 'private ancestors' are people in private trees, whose identities are hidden, though the Ancestry member concerned is shown with their potential relationship to you. This is more information than you normally get from a match with someone having a private linked tree, so could be very useful in sorting out who to contact. Not seen that but I have enabled "New & Improved DNA Matches". Somewhat strangely, when I changed the linked tree a few months ago I lost all my "Shared Ancestor Hints" but they are shown in the new layout. Not seen that but I have enabled "New & Improved DNA Matches"
Another one I hadn't seen. I've now enabled this, and I see it is a good way of displaying more information about each person in the summary screen without having to go to the separate 'view details' page. Also the ability to create (colour-coded) 'custom groups' to help organise the match list. I had a good look yesterday and wasn't particularly impressed. The potential ancestors were being offered as alternatives to what I have in my tree, and mostly just plain wrong. One potential ancestor from another tree had just a forename, and since I already know her full name, it seemed somewhat pointless. A couple of others listed are possible ancestors but not included in my tree as there is no evidence to support them being there. I'm very pleased so far - see the next newsletter (out soon) for more details. Ohh, how do I enable that? Can't seem to find it, but I like it! Actually, so far those with private trees show up, as long as you share the same ancestor, and it places them under their particular ancestor (as with above), which is really useful. I think so far I've seen about 5-6 cousins that I hadn't previously found, for various reasons, but it has very clearly pointed out where they link in with me. One even had a child of a 5th great aunt I didn't have (in the dotted box) with the person I shared DNA with below them... so it quickly opened up new links. The "private" ones, I think are those people who are appearing on someone else's private tree, but I haven't added them to mine, although when I clicked on one it shows who is the direct line below, so that's no problem for me. I'm hoping "Maria" is only there because Ancestry hasn't updated it's DNA results to match my new tree information! Of course, it is limited (as was the DNA Circles) by information added by our relatives on trees! 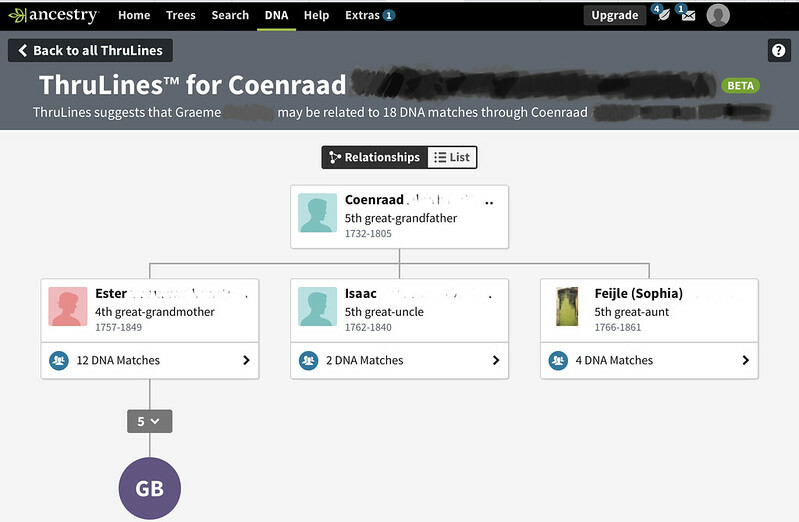 Another thing I noticed about Thrulines which didn't impress me, is that it defines my husband and his brother as half siblings, even though it is clear from the amount of DNA they share that they are full siblings, and they are listed as such in the main results section. I think this screenshots what I am starting to think is the most useful part of this... remember that those who have dotted lines around them are not in my tree. (GB is my father, as with the previous example - this example would also appear for my grandmother if I had opened the little "2" just above GB - which is the number of generations down). "Ashlee" did not appear as a hint previous to this feature, because I don't have the people in the dotted lines, and on my previous notes, I had a question mark query, but no actual definition of where she fit in my tree. This feature just did a lot of work for me, in seconds! I haven't seen anything quite like this. For me, all the people in dotted line boxes seem to be 'potential ancestors', mostly replacing the ancestor I have entered in my tree. So far all the ones I've looked at would fall into the categories of 'fictional ancestor' or 'speculative ancestor'. I can see this kind of thing by looking at the trees of people in my list of matches. OK, I have now managed to find something like your screen shot above. I guess it does help a bit by pulling several matches together on one screen. I've now noticed that some of the relationships in my tree have been redefined in Thrulines. For example, my descent from one of 3 x gt grandfathers is showing as being via his 3rd "wife", when actually it is his 1st wife who is my ancestor. Must admit that I found the Thrulines feature somewhat underwhelming but that was after I had enabled and taken a good look at New & Improved DNA Matches Beta. The Improved DNA ‘green leaf’ Common Ancestor filter produced 39 actual/potential ancestors compared to 24 with the current system. Thrulines showed a few (definitely not all) of the 15 additional ‘green leaf’ matches and of the 29 Potential Ancestors 20 were incorrect. So definitely a thumbs up for New & Improved DNA Matches but it does not have the most useful surname or location search feature which the current system has. Unfortunately Thrulines did not tell me anything I did not already know or that Improved DNA was showing me. However if Thrulines is to replace Circles then it is an improvement as I still await my first Circle! With a combination of both the ThruLines and the Improved matches, I almost have more “common ancestor” tags than I previously had hints... and given that my father and grandmother each had in the region of 25-30, it’s pretty impressive. Same here. And I really dislike the way it is substituting people from other matches’ trees for ancestors in my own tree. I discovered ThruLines yesterday when I checked the site for new matches. When I clicked on it I saw a "potential ancestor" and "private" in the top row so I clicked on that. In the List it states this potential ancestor is my paternal grandfather but it also says "private"; however, when I click on that it gives the name as what has apparently been proven to be incorrect. I have just sent a message to the person who owns that tree. I have not checked the site out further but will do so. I just also enabled the New and Improved DNA Matches after reading Peter's newsletter. I would not otherwise have known about those. I will be looking at that as well. Just taken a look at ThruLines after spotting reference to it in Peter's Newsletter, and have to admit find the early relationship list to be quite exciting with some interesting Potential Ancestors showing for me to explore when I have time . I think the results are even more beneficial having no long ago changed my Tree match from my 'cut down' direct ancestry Tree to my original Public Tree. I have a few private ancestors showing as well, but will concentrate first and foremost on the potential ones. I will also enable "New & Improved DNA Matches" and see what that shows. Yes well done Ancestry. 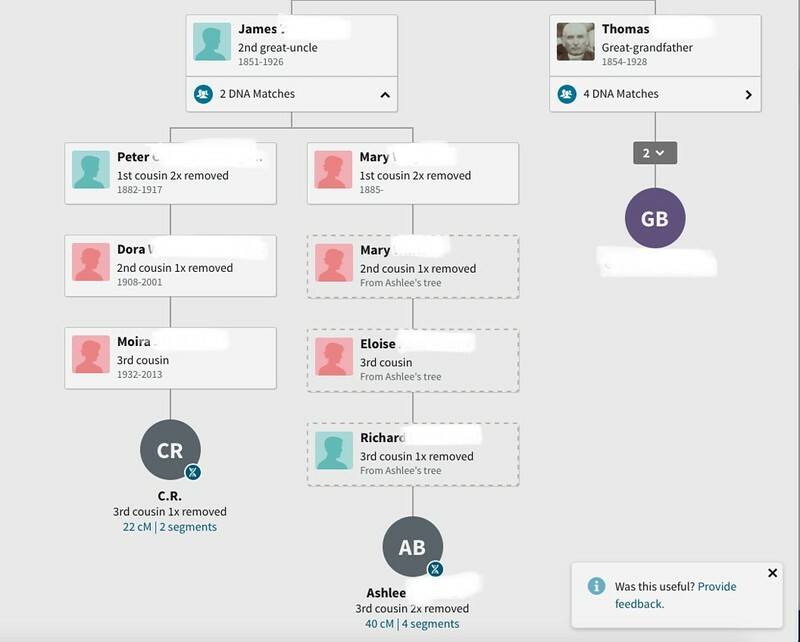 Has anyone worked out what criteria Ancestry is using, for the purposes of ThruLines, in order to discount genuine ancestors shown in my own tree and replace them with fictional ancestors from the trees of other matches? I take the points made by Peter in the latest newsletter, and by others earlier in this thread, but it seems to me that the potential usefulness of this new feature is being seriously undermined by this "ancestor substitution". 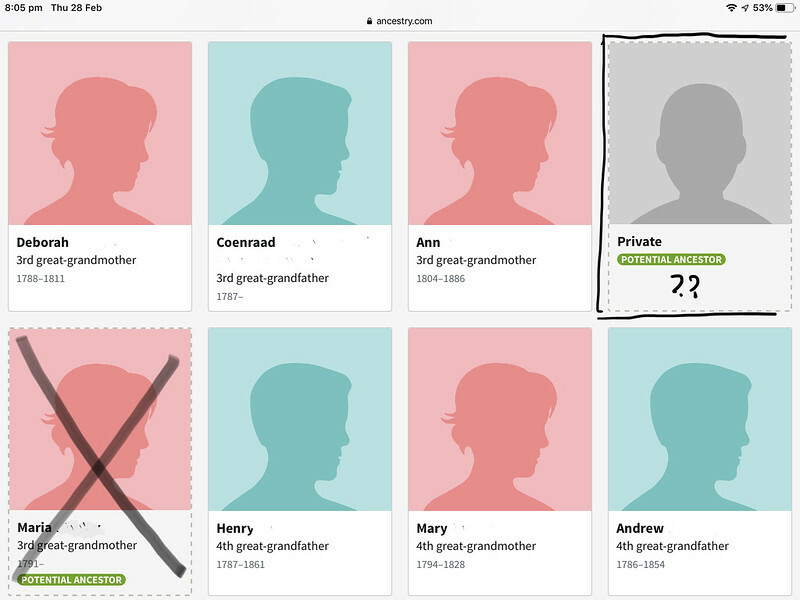 Not only is it annoying to see a list where my genuine ancestors have been replaced by fictional ones (and to have no power to change this), but more significantly it means I am unable to use this new tool to find information about those displaced genuine ancestors as, for the purposes of ThruLines, they have been completely removed from my ancestry. So far it would seem that using the "New & Improved DNA Matches" feature means I cannot edit my existing notes on individuals nor write new notes on any individual. Has anyone found a way I have not yet seen? Have you already joined the forum? No, but I have been invited to join.